Rugged and beautiful 43-meter global expedition yacht currently in development. This is a ship repurposed as a luxury yacht, not a yacht masquerading as an expedition vessel. The foundation of this exquisite expedition craft is a Japanese built commercial vessel which is given new life with all-new fit-out including custom superstructure, electrics, systems, navigation, hotel facilities and luxury quarters for you and your guests. The result is an immensely seaworthy, fuel-efficient and reliable expeditionary yacht that is ready to take you, your family and special guests to the far corners of the earth in absolute comfort, luxury and security. Now you can have this rugged and beautiful expedition craft in less time than it takes for new construction and at half the price, with no compromises. Contact the broker for links to more information, including examples of the build quality, video of the conversion process and detailed options available. United Yacht Sales Emerald Coast would love to guide you through a personal showing of this 141' Custom Conversion 43 m. Expedition 1990. This yacht for sale is located in Unknown Philippines and priced at $6,999,000. For a showing please contact us by filling out the form on this page and we will get back to you shortly! To see the quality of the build process and attention to detail, you must fly in and take a look at the completed sistership sitting in the yard. You can review her here: http://asiayachtsales.com/vehicle/cklass-45-4m-my/. This completed vessel is available for sale and is exquisite in every detail. Not everyone has the same objectives when it comes to outfitting an expedition class superyacht. But everyone will agree on the importance of a solid, reliable foundation. We start with a platform of exceptionally maintained Japanese Government steel hulls, dynamic positioning capable prime mover systems and zero-timed main propulsion in each of the designs. From there on up, it's all according to your taste and intended usage. Whether you want or an exquisite superyacht with helipad and tenders or a toy-hauler / shadow boat to tend your circumnavigating superyacht, we can help you develop the perfect package. The general arrangement drawings shown throughout the preceding pages are ready to be thoroughly customized to your most exacting specifications. The interior and exterior renderings can give you an idea of the scope of customization you can select, but we are happy to work with you to detail out your specific requirements, right down to your theatre system components, satellite communications, decor and your gym equipment. Once you’re completely satisfied with the design details, this project can be ready for adventure in just 24 months. There are four concept versions fully developed and they include: a spectacular Beachclub version, a concept that will accommodate your two-ton helicopter and two different versions with unlimited air draft tender accommodations (for your sportfisher or sailboat). Please review the concept drawings and renderings and then contact us for details on mixing and matching various features or creating something entirely different. Also please note that your choices are not limited to the 43 meter project currently being started. If you want something either larger or smaller, give us a call for a preliminary discussion. 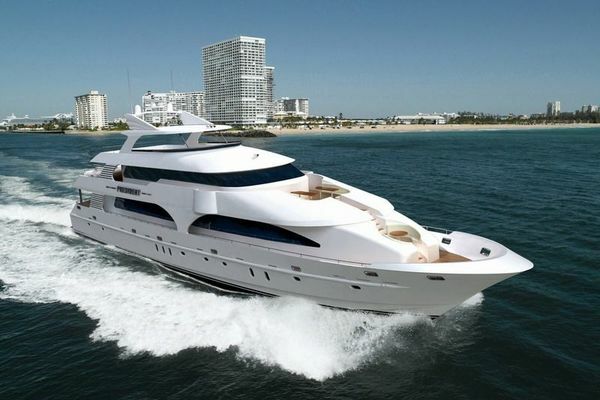 One of Optimus’ primary features is its roomy Beach Club lounge located on the aft main deck. Easily accessed internally or from the aft boarding platform, this area offers surround seating with table, port-side bar area, large massage platform and a forward gymnasium. Optimus also offers an ample-sized toy garage separated from the Beach Club by a huge glass panelled wall with sliding doors. Toys can be easily launched and retrieved through large 3.5 meter fold-down terrace doors on both the port and starboard sides of the vessel. These fold down terraces also make easy work of tender birthing, marina boarding or recreational access to the sea. Directly adjacent to the toy store is a sauna/changing room and a separate day toilet. The large upper boat deck is perfectly suited for two low-profile 7 meter tenders. After the tenders have been launched, this area also provides a fantastic sunbathing platform for day or an evening entertainment area. Hydraulic submersible transom platforms make it easy to embark & disembark with your scuba gear. Thalassa’s primary feature is its ability to accommodate an 8 meter unlimited air draft tender on her port side main deck. This tender offers the opportunity for extended excursions from themother-ship, sport fishing, sailing or comfortable all-weather ship to shore operations. In addition to the main tender, Thalassa can also carry a mini-submarine, a fleet of jet skis, a low profile 7 meter tender (or other water sport equipment) on her upper starboard-side boat deck. All are launched and retrieved by Thalassa’s 4,500 kg crane. The starboard main deck features a shaded 35 square meter beach club with 3.5 meter fold-down side terrace allowing direct access to the sea. When the main tender has been launched, the port side can provide a further shaded 35 sqm area by setting a canvas awning. There is also a 3.5 meter fold-down terrace to port. Other main deck features include a 6 sqm day toilet/steam shower forward and a 4.5 sq. m. glass-walled gym aft. Optional hydraulic submersible transom platforms make it easy to embark & disembark with your scuba gear. Optionally, Thalassa can be configured to accommodate two unlimited air-draft tender craft. Call or write for details. The key distinguishing feature of the ‘Aether’ concept is its two-ton, 75 square meter helideck perfect for an EC-120 or similarly-sized helicopter. When not in use, Aether’s helideck provides a fantastic sun- bathing platform by day and a roomy area for elegant evening starlit entertaining. Aether can also carry two low profile 6 meter tender (or other water sport equipment) on her 70 square meter boat deck. Tenders and toys are launched and retrieved by dual synchronized beam lifts rated at 1,250 kgs. into a beachclub area complete with port and starboard 3.5 meter fold-down terraces. These terraces not only allow you and your guests direct access to the sea but can also facilitate convenient tender side boarding or dock boarding when along side. Other main deck features include a 9 sqm day toilet/steam shower/changing room forward and a 9 sqm glass-walled gym directly behind the aft transom.